For a man who gave the entire mobile crazy world a clue into the next launches of smartphone majors like HTC, Motorola and Microsoft, this must be a sad day. @evleaks aka Evan Blass who had been giving us engrossing tips about smart phones and tablets today announced retirement due to financial pressures. 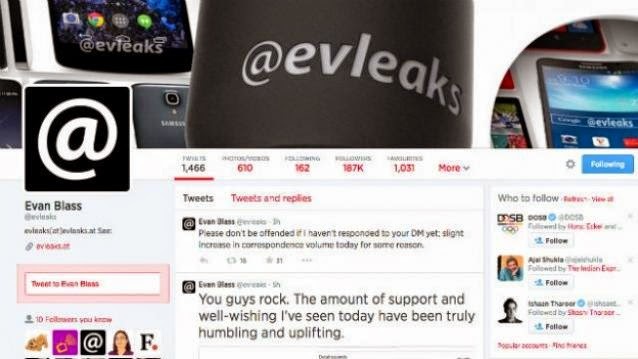 Evan Blass who leaked major smartphone and tablet news to the world under the handle @evleaks had revealed his identity last year. He ended his prolific leaking career with announcement on Twitter saying, “All good things must come to an end. Thank you for an amazing two years.” Check out his tweet below. Sadly Blass was also diagnosed with multiple sclerosis and is in need of funds. Evan Blass, worked with the popular technology blog Engadget from 2005 to 2008 and later he was Managing Editor at Pocketnow.com.